This Website is also available in German. Ce site est également disponible en français. You can also help the Esel-Initiative with the second children's book by Stefanie Christmann! New travel reports and new numbers here. Our chair Stefanie Christmann visits and reports from our projects on site. Read her latest report. Our cooperation partner is Sahayog Himalaya-Nepal. The Esel-Initiative photo exhibition is touring Germany. Find out where it is right now! 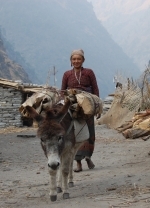 Supporters of the donkey project have been amazing us with the ideas they come up with. Do you have one, too? A small group of volunteers runs the Esel-Initiative. Meet them! Help the Esel-Initiative! A single donation can secure the existence of a single-parent family for years to come.